Edward Gardner conducts the BBC Symphony Orchestra in late music by William Walton. It follows the success of his recording of Walton�s Symphony No.1 and Violin Concerto � one of Chandos� best-selling recordings for 2014. With an air of relaxation that differs from the tension of his previously recorded early works, the music on this album is likely to cause as much excitement! 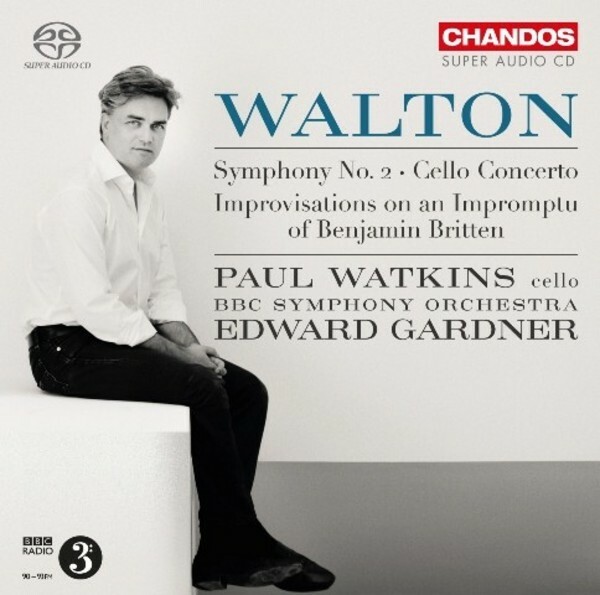 Walton�s Second (and last) Symphony was commissioned for the 750th anniversary, in 1957�58, of the founding of the city of Liverpool but, delayed by the composition of the Cello Concerto, it was only premiered in 1960. Scored for a large and colourful orchestra, it is based on the same model as the Third Symphony of Albert Roussel, with a similarly compact duration and the use of the key of G minor, and a concentration on angular melodies, sharply dissonant harmonies, and motoric rhythms. The Cello Concerto was premiered in London in 1957 by the BBC Symphony Orchestra itself. The cello soloist here is Paul Watkins, exclusive on Chandos, highly praised as a member of the Emerson String Quartet, but also the Artistic Director, since 2014, of the Great Lakes Chamber Music Festival of Detroit. In this piece, the traditional structure of Walton�s earlier concertos � a moderately paced opening movement followed by a central scherzo � ends in a rich finale consisting of a theme and four �improvisations�. The concept of �improvisation� occurs again in the last work on the disc, based on the �Impromptu� of Benjamin Britten�s Piano Concerto.